The Sanitizable Mini Keyboard features a Dirt and Splash Water Resistant Silicon Key Membrane with an optional Fix Membrane Spray/Wipe Disinfection Replaceable Membrane for Steam Sterilization Low force tactile feel for a true touch typists. It also features Article-No. : AK-C4100 MedicalKey, AK-C4100F-UV Spray and wipe sanitizable keyboards with silicone key membrane for heavy duty type writing applications. A selection of US and German key layouts are available. 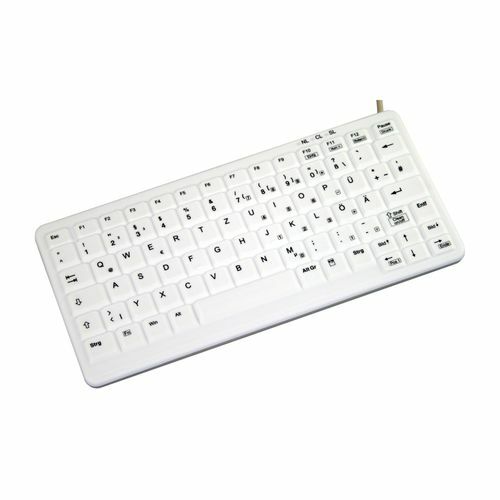 The keyboard has a USB connection available in black, white or light grey.The Sanitizable Mini Keyboard is ergonomically-designed for true touch typists with silicone key membrane, low force key actuation and precise key guidance, sanitizable hygiene keyboard and small dimensions. Other special customer benefits are dirt and splash water resistance, no ingress of debris and easy to clean and disinfect. The germs do not proliferate because the keyboard could be cleaned by submersion. This keyboard is recommended for use in hygiene critical office and administration applications.